The Young and the Restless (Y&R) spoilers for Friday, November 3, tease that things will be tense at the scene of the fire. After Billy (Jason Thompson) comes to the rescue on Thursday’s episode, he’ll be in grave danger. Charlie (Noah Alexander Gerry), Mattie (Lexie Stevenson) and Reed (Tristan Lake Leabu) will all be saved, but Billy will be stuck in the massive blaze. On Friday, Jack (Peter Bergman) will arrive in panic mode. It seems this dire situation will actually soften his cold heart. Jack has been battling Billy for months, but the crisis will bring out fear and deep love. When Jack wants to go inside, the firefighters will inform him that it’s not going to happen. They won’t want anyone else to get trapped in the flames and smoke. 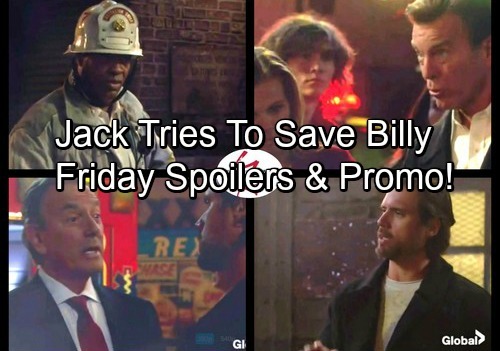 The Young and the Restless spoilers say Jack will snap at the firefighters for trying to stop him. He’ll declare that they’ll have to physically restrain him if they want to prevent his rescue efforts. Jack will contend that they can’t keep him from his family. He’ll show genuine concern for Billy in these dark moments. Of course, the firefighters will likely assure Jack that they’re more equipped to deal with this. Cane (Daniel Goddard) will understand since he nearly burst in there himself, but he may side with the professionals. Fortunately, Billy will be rescued one way or another. 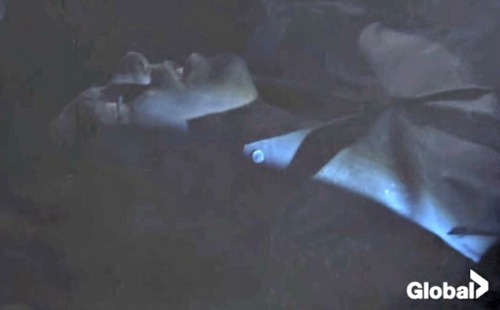 The Y&R hero will make it out of this mess alive, so that’s good news! 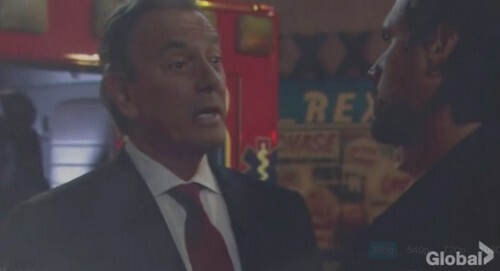 Other Young and the Restless spoilers say Nick (Joshua Morrow) and Victor (Eric Braeden) will face off. It appears they’ll argue about the blaze and the extensive damage. Nick will suggest that Victor shouldn’t worry. He won’t be going to his father for help. Nick’s far too proud to beg ruthless Victor for assistance right now. Victor will want to make his position clear anyway. He’ll shout that Nick won’t get a dime from him, no matter how low he sinks. It sounds like their war is revving up once again. Is there anything that can bring Nick and Victor together? Reconciliation is possible, but it’s certainly not going to happen anytime soon. Y&R fans won’t want to miss all the excitement. We’ll give you updates as other details emerge. Stay tuned to the CBS soap and don’t forget to check CDL often for the latest Young and the Restless spoilers, updates and news.